George Lucas doesn't want me to tell you this, and if I do, I'll probably never be invited to Skywalker Ranch. Of course, since I'll probably never be invited to Skywalker Ranch, anyway, I might as well go ahead. This year marks the 20th anniversary of "The Star Wars Holiday Special." "Star Wars Holiday Special?" you say? "The Star Wars Holiday Special" aired for the first — and last — time on CBS on Nov. 17, 1978. "Star Wars" was at the height of its popularity. After just missing Christmas 1977 (children had to make do with gift certificates), the toys were everywhere. Every red-blooded, American boy carried his lunch to school in a "Star Wars" lunchbox or slept under "Star Wars" bed sheets. Every girl decided she, too, could be a princess. Children were all excited about "Star Wars," but, unfortunately, there was little "Star Wars" to be had outside their own imaginations. The '70s were the Dark Ages. If you had a VCR — and, chances were, you didn't — it was a huge, clunky monstrosity. There were no video rental stores, and even if there were, it didn't matter. "Star Wars" was years away from being released on video. The first "Star Wars" sequel, "The Empire Strikes Back," was still nearly two years off. There were a few "Star Wars" novels and Marvel's comics series, but not much more. Children hungry for new adventures with Luke Skywalker, Han Solo, Princess Leia and the rest were, by and large, out of luck. Once you understand the arid climate of 1978, you can understand why someone, somewhere actually thought "The Star Wars Holiday Special" was a good idea. It wasn't. It was two hours of pure horror. 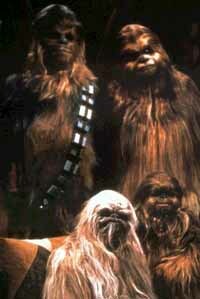 The special's plot, such as it was, revolved around Chewbacca the Wookiee's family: his wife, Mala; his father, Itchy (! ); and his son, Lumpy (!!). On Chewbacca's home planet, Kashyyyk, it's time for the Wookiees' version of Christmas, Life Day. [AUTHOR'S NOTE: The Holiday Special actually aired around Thanksgiving.] As Chewbacca and Han Solo dodge Imperial starships in a race to get to Kashyyyk before the festivities end, Chewbacca's family waits. And they wait. And they watch some television. And they wait. And they put up with some nasty (well, silly, actually) Imperial soldiers. And they wait. Eventually, Chewbacca arrives and the bad guys are dispatched, as I know you are surprised to learn. Of course, as with any holiday special, al la Bob Hope or Andy Williams, there are guest stars. Art Carney, Bea Arthur and Diahann Carroll supply what passes for comic relief. Jefferson Starship supplies what passes for a musical number, and Harvey Corman (in several roles) supplies yet more (passable) comic relief. At this point, I'll stop to remind you that I'm not making any of this up. Of course, the most amazing thing is that virtually the entire "Star Wars" cast except for Alec Guinness and Peter Cushing, both of whom were fortunate enough to have their characters die in the film, agreed to show up for this travesty. Mark Hamill has a few cameos in which he wears far too much eye makeup. Harrison Ford looks like he really wants to be somewhere else. Even James Earl Jones turns up to dub new lines onto stock footage of Darth Vader. Worst of all, Carrie Fisher sings (badly) the horrible Life Day song, which is — wait for it! — set to the "Star Wars" main theme. When watching "The Star Wars Holiday Special" one is overcome by two conflicting emotions: pity for the actors and the desire that everyone involved with the project die a horrible death involving fire ants and sugar substitutes. None of this is to say, believe it or not, that the special doesn't have its redeeming moments. In the middle of the broadcast was an 11-minute cartoon segment, notable mostly for featuring the first appearance of the bounty hunter Boba Fett, who would later play a major role in "The Empire Strikes Back." Lucas hated the special, with which he had little involvement. And, according to "Star Wars" historian Steve Sansweet, Lucas said that if he had the time and a hammer, he would track down every bootlegged copy of the special and smash it. Needless to say, don't look for a rebroadcast or a video release of the special any time soon. Still, bootleg copies are available if you know where to look, and a RealVideo version of the special is sometimes offered for download at www.lucasfan.com. [AUTHOR'S NOTE: The special is no longer hosted there.] So, you can see the special if you really want to, but I can't imagine why you would. Of course, if he wants a real challenge, Lucas could try to fix the "Holiday Special" by giving it the "Special Edition" treatment he gave the movie trilogy last year. I'm sure Jefferson Starship's musical number could be improved by having the band destroyed by the Death Star's superlaser. AUTHOR'S NOTE (12/26/11): In the years since I wrote this column, the Star Wars Holiday Special has become much easier to find online, and re-watching it during the holiday season has become an annual ritual for some Generation Xers. It even has been riffed by some of the former Mystery Science Theater 3000 crew.